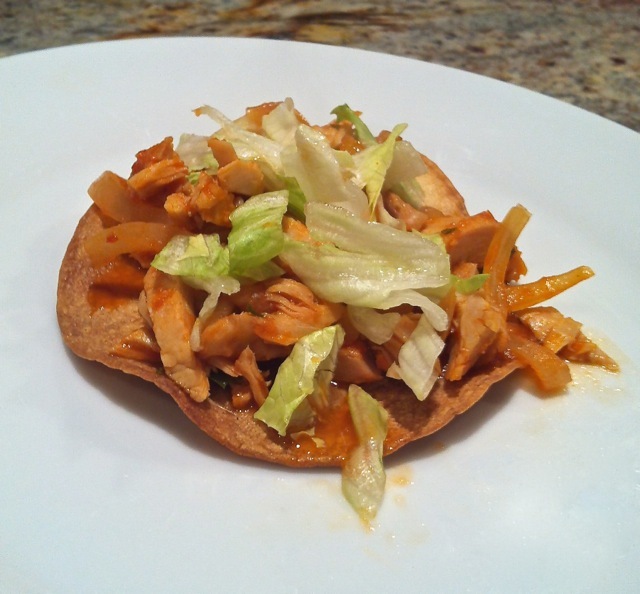 Chipotle Turkey Tostada is a variation of the Puebla dish, “Tinga” whose base is tomatoe, onion and chipotle. I made these with turkey leftover from yesterday’s Thanksgiving feast. The combination of tomato, onion, garlic and chipotle is the basic flavor profile that is used in the classic dish known as “Tinga.” Served in Puebla and central Mexico, It is usually made with shredded chicken or pork, sometimes beef. Guajolote, turkey, is of course native to Mexico and so it takes well to chiles and tomatoes and that’s why I like to treat it as a “tinga” dish, served on tostadas. If you like the “slightly gamey” flavor of turkey, I think you’ll like how the chipotle accentuates the flavor of the wild. I add laurel and just a bit of tomillo (rosemary) for aroma. Served on the crispy tostadas the textures are interesting and delicious. The crispiness of the tortilla begins to soften in the areas that meet the soupy chipotle turkey, so you’ll taste partly crunchy, partly melting, hmmmm. Baking the corn tortillas makes them perfectly crispy and reduces the amount of oil. 1. Place tortillas on cookie sheets and brush both sides of each tortilla lightly with Canola oil. 2. Bake for 15 or 20 minutes until they are golden brown and crispy. Set them aside. 3. In a blender, add the tomatoes, tomato juice, garlic, salt and water and blend into a smooth purée. Set aside. 4.In a large skillet heat 1 Tbs Canola oil on medium heat and cook the onions until they are translucent. 5. Add the tomato mixture, laurel leaf and rosemary, and bring to a boil. 6. Add the turkey, and simmer, uncovered, for 15 minutes, allowing some of the liquid to evaporate and the sauce to thicken slightly. To assemble the tostadas, just spoon a generous amount of the steaming turkey a including the tomato liquid, onto the tostada. Top with the shredded lettuce. Each of your guests can assemble their own. Sometimes you can place a side dish of queso fresco or shredded queso panela to top the tinga before you add the lettuce.